Codey&apos;s on-board speaker enables Codey to play sound. You can write music, add sound effects, and do other fun stuff with Codey&apos;s speaker. Make Codey&apos;s speaker play a specified sound. Press Button A. Codey will play the sound "hello". Make Codey&apos;s speaker play a specified sound, and wait until it&apos;s done. Make Codey&apos;s speaker stop playing all sounds. Press Button A. Codey will play the sound "hello" for 10 times, and then stop all sounds. 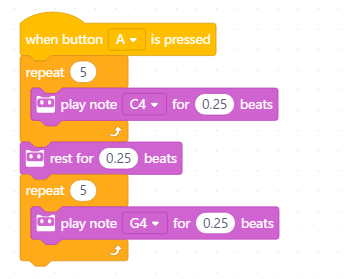 Make Codey&apos;s speaker play a specified note for specified number of beats. Press Button A. Codey will play the note "C4" for 0.25 beat. 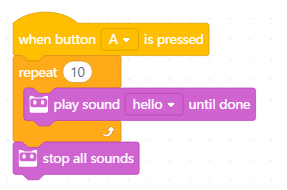 Make Codey&apos;s speaker stop playing sounds and wait for specified number of beats. Press Button A. Codey will play the note "C4" for 0.25 beat 5 times, and after waiting for 0.25 beat, play the note "G4" for 0.25 beat 5 times. Make Codey&apos;s speaker play sound at specified frequency for a specified period of time. Press Button A. Cody will play a 700Hz sound for one second. Change the sound volmue of Codey&apos;s speaker. Input positive number to increase sound volume, or negative number to decrease sound volume. Press Button A to decrease sound volume of Codey&apos;s speaker by 10. Set the sound volume of Codey&apos;s speaker to specified percentage (0 ~ 100). When Codey starts up, the sound volume of the speaker will be set to 60%. Report the sound volume of Codey&apos;s speaker. Press Button A. The current sound volume of Codey&apos;s speaker will be displayed on the screen.